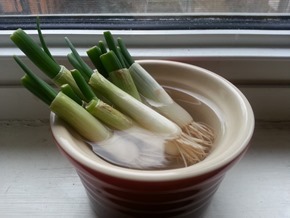 If you leave a little bit left when chopping green onions, you can grow new ones. The ones on the right are remnants from last week’s cooking session. Look at how quickly they’ve grown! It’s fascinating to see the difference day by day. We don’t grow many plants indoors because the cats like chewing on things. I wish I could grow herbs like parsley and rosemary throughout winter, or start seeds for tomatoes and basil, but we don’t have the sun or space for it. We have a spare room upstairs, but it’s dark and carpeted, so working with soil is less fun. Oh well! When the weather warms up enough, I’ll jumpstart the garden with seedlings and set up the greenhouse for more seeds. I bike through High Park and along the lakeside trail on my way downtown. There are many trees along the trail, and they’re starting to fuzz up with brown leaf buds. I’m sure we’ll see more green soon! What will we plant this year? The garlic we planted last fall has survived the confusing weather. It now pokes out through the chicken-wire that we stapled over the box to thwart squirrels. We’ve been cooking with a lot of cilantro, parsley, bok choy, and green onions, so I’d like to grow those. Snow peas and sugar snap peas, mmm – I hope it’s not too late. Lettuce might be nice, too. And I’d love to give bitter melon another try, and maybe zucchini. I want to spend more time gardening this year, so let’s see how that works out!